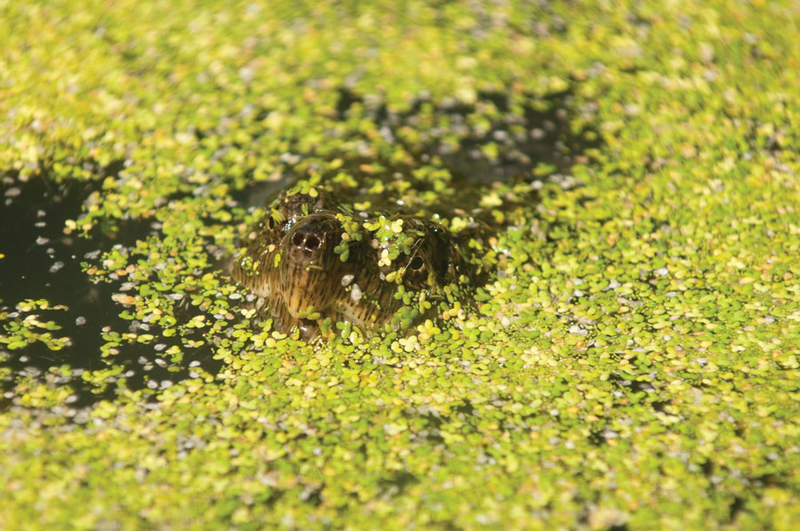 In Ontario, there are 8 species of native turtles: the Midland Painted Turtle, Snapping Turtle, Blanding’s Turtle, Northern Map Turtle, Spotted Turtle, Wood Turtle, Musk Turtle and Spiny Softshell Turtle. All but the Painted Turtle are accorded some status under Species at Risk legislation. Two (Snapping and Northern Map) are species of Special Concern, 3 (Blanding’s, Musk and Spiny Softshell) are threatened and 2 (Spotted and Wood) are endangered. All of these species live largely aquatic lives. They vary considerably in how much time is normally spent out of the water, travelling from one body of water to another or foraging. All, however, must come up to land in order to lay their eggs in the springtime, and in doing so, expose themselves to all manner of risks. For most of these species, the greatest risk is that of being run over on a road or highway. Turtles typically look for loose, sandy soils in which to lay their eggs. Exposed soil suitable for egg laying may be difficult to find in more natural habitats and turtles appear to be attracted by artificially-created potential nest sites, such as the shoulders of roads, gravel drives, railroad embankments and earthen dams. While getting to and from these locations and while in the open laying eggs, they may be vulnerable to both predators and to vehicular traffic. Turtles are ancient creatures whose patterns of life were well developed before the invention of the internal combustion engine. Although roadways may lure them with potential nesting sites, or lie between them and a chosen nest site, turtles are poorly equipped to navigate across busy roads and many are struck by vehicles. Here in Ontario, attempts have been made to document how many turtles are killed on roads each year, either on a local basis – Kawartha Lakes and Long Point – or across the southern part of the province. There are obviously no simple solutions to the problem of turtles and roads. The Kawartha Turtle Trauma Centre provides veterinary care to injured turtles, in addition to a variety of educational outreach and research activities. 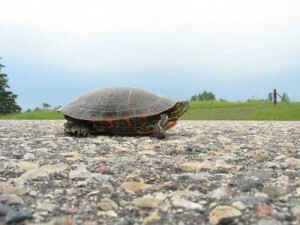 Preventing turtles from being struck on the road likely would require a combination of engineering (providing safe crossing areas), driver education and seasonally adjusted speed limits. 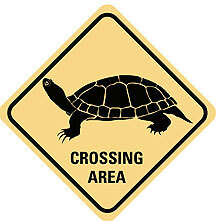 In addition to the hazards presented by highways, turtles also face the risk of predation when they are away from water. This is obviously a much greater risk for small turtles than it is for the larger species, particularly the snapping turtle. Smaller species, such as the musk turtle, may be preyed upon by raccoons, skunks and other terrestrial predators. However, the painted turtle seems to face an unusual threat of predation in parts of its range. The range of the painted turtle overlaps with that of the raven only in its more northerly portions. Here in Ontario, the Canadian Shield country that lies between the Ottawa River and the Manitoba border is home to both of these species. Our lab has twice received submissions of multiple painted turtles that were found dead during the nesting season, and were likely victims of attack by ravens. One was from the Atikokan area in northwestern Ontario and the other was from Petawawa, east of Algonquin Park near the Ottawa River. In both of these instances, adult painted turtle carcasses were found, flipped over onto their carapaces, with all viscera removed from the body cavity. Each turtle had a semi-circular wound, approximately 2-4 cm in diameter, in the groin. Observers reported seeing ravens harassing the turtles in pairs. While one raven distracted the turtle by attacking at the head, the other bird came from the side or behind and flipped the turtle onto its back. Once the turtle was in this helpless position, the ravens would peck a hole in the abdominal wall near the upper part of the hindlimb, and would pull the viscera out through the hole they had created. Ravens are notoriously clever birds and this is likely a learned behaviour. Predation of this sort is unlikely to have a significant effect on turtle populations, except on a local basis, but is a good demonstration of the hazards that turtles encounter when they leave the water. Road mortality of snapping turtles, Chelydra serpentina, in central Ontario during their nesting period. Tim Haxton.2000. Canadian Field Naturalist. 114(1): 106-110. Road mortality of amphibians, reptiles and other wildlife on the Long Point causeway, Lake Erie. E. Paul Ashley and Jeffrey T. Robinson. 1996. Canadian Field Naturalist. 110(3): 403-412.